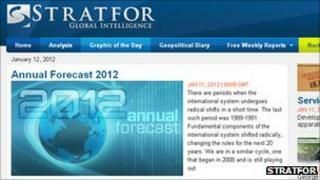 Global intelligence analysis firm Stratfor has relaunched its website after a hack attack forced it offline on Christmas Day. The attack brought down Stratfor's servers and exposed thousands of customer credit card numbers and other personal information. Stratfor have described the attack as "censorship", but apologised for not encrypting credit card details. Members of the loose-knit hacker group Anonymous claimed responsibility. In a lengthy statement posted to the US company's website, founder and chief executive of Stratfor George Friedman said of the lack of encryption: "I take responsibility for this failure, which has created hardship for customers and friends, and I deeply regret that it took place." In the aftermath of the attack, Mr Friedman posted several videos and messages on Stratfor's Facebook site to apologise to its customers. Some self-described members of Anonymous had claimed to have used the stolen credit card details to give money to charities, but others expressed concern that fraudulent donations would have to be returned and could result in the charities losing money. The company has offered to provide credit card fraud protection for customers whose details might have been compromised. Mr Friedman said the attacks were "a new censorship that doesn't come openly from governments". He also rejected characterisations of the company as the "hub of a global conspiracy", adding: "We are what we said we were: An organisation that generates its revenues through geopolitical analysis." Mr Friedman said the company was returning to "the work we love... analysing and forecasting how the world works". He said an FBI investigation into the attack was continuing.